A king is increasingly angry with his wife for giving him daughters. When she dies in childbirth bearing a thirteenth daughter, he banishes the newborn to the castle kitchens in his rage. 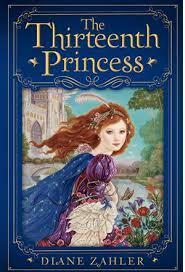 At seven, sort-of servant Zita learns she is sister to the princesses and daughter to the king. She doesn’t bemoan her lot, but she does sneak around behind her father’s back befriending her lovely older siblings. Happily, the older girls are very willing to take her under their wings. Zita also befriends a stable boy named Breckin whose brother is a soldier. It isn’t until she is older that Zita begins to worry that her sisters might be under a spell. For one thing, the twelve princesses don’t understand themselves why whenever suitors come to call, they are unable to speak. Thus they all remain unmarried. Then Zita’s sisters begin to appear weary and sickly, and their shoes start turning up with the soles worn through every morning. With Breckin’s assistance, Zita investigates her sisters’ troubles; she also discovers a helpful witch living in hiding in the woods. (The king has banned magic from the kingdom, or so he thinks.) But someone is watching Zita, and she still hasn’t figured out who is behind the malevolent spells. She even worries that the king himself has done this terrible thing to his daughters. Of course, our heroine eventually discovers the truth and saves her sisters.